Yesterday was the annual Spanish Peak's Christmas Bird Count, led for the past 21 years or more by Dave Silverman, our compiler. I got lucky and was able to ride 'shot-gun' with him, which gave me the opportunity to learn a lot and see far more birds than I'd have otherwise. The weather was perfect; sunny and bright and without wind, though it never got warmer than 30 degrees. Other folks who counted included Margie, who I remember from last year and comes down from Pueblo, and Tom Doerk who brought a friend and offered us a place to meet mid-day. As he always does for the count, Tom opened his home as place to eat our bag lunches and made a wonderful soup, offered hot chocolate and tea and included the best sliced pears I've had in years. Fresh is best! Other La Vetions included Polly and Paul Neldner as well as Dave Moore. We split up into two's and three's and headed out to our slice of the 15 mile-radius counting area. I would say a good time was had by all. It was a good count, too; 44 Species this time. that hangs outup near Annie and Dave's place, here in La Veta. Paul and Polly got a fine picture of it...good thing because Dave and I totally missed it when we went looking! At the Neldner's home, there have been large flocks of all four jays; as many as 40-50 Pinyon Jays, plus a few each of the others. Good to hear, as the Pinyons are just about on the danger list. 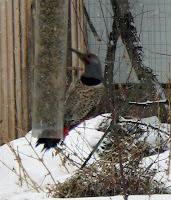 We found many Scrub and Steller's at Dave Moore's home, too; feeding on old Juniper trees. Nobody else seemed much impressed, but I enjoyed watching the Towsend's Solitaire there, too. 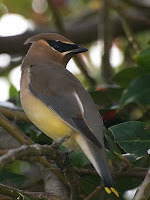 Perhaps the greatest highlight was finding a sweet flock of Cedar Waxwings, feeding in the same trees! They were a count first. their bird's names when we do not do the same in the name of science! ...I agree!) We saw the red-breasted beauties everywhere. I'm always surprised at how big they are; are they smaller on the West Coast, I wonder. We'd all been on the watch for a towhee, but it was Paul and Polly (again) who found them and even got a picture of this gorgeous Spotted Towhee in their own yard. Nice! One of the birds I've not seen in around my yard yet, is a Brown Creeper. Now, I know they have to be here...and Dave Silverman pointed out two just around the corner from where I live; but the most exciting thing is when the gang went out to listen to the Great Horned Owl we got to add to our list...they saw a Creeper in my yard! Not being familiar, really, with the little creepers, I 'PhotoShopped' a couple pics from Wikipedia to give an idea what they look like. They're tiny little things that spiral up a tree-trunk...working it all the way. 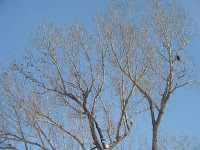 When they get up maybe to where the tree begins to limb, they fly down and start all over. They're way cool! Obviously, I do not know my sparrows...nor how rare they can be. Or perhaps it is because I've seen them in my yard and had no idea they were rare for the Christmas Count...but the rest of the group was very happy the Neldner's got a White-throated Sparrow to add; in addition to the lovely photograph. Those two are awesome at catching the hard-to-find ones! looking for aquatic bugs and such. Margie got the bird and added it to the count, not often accomplished during this count. Dave and I were unsuccessful with the Dipper, but somehow I managed to find a Wilson's Snipe; first one I've ever seen. Dave had really wanted to find one...yeah, I was tickled pink! 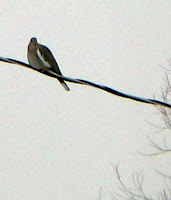 That he found the White-winged Dove in my yard was another plus for both his county list and our Christmas Count. Dave taught me to look for raptors while driving around the volcanic Dykes. He suggested we 'scope' along the top of The Great Wall, saying that the big birds often sit and survey the surrounding area . He was right on the money. I thought this painting, by Archibald Thornburn showed exactly what we saw. I thank Dave again...I learned so much while birding with him. Cackling Goose, 2; Canada Goose, 175; Mallard, 15; Wild Turkey, 82, (HC); Bald Eagle, 1; Sharp-shinned Hawk, (CW); Red-tailed Hawk, 10; Golden Eagle, 1; Prairie Falcon, 1; Wilson's Snipe, 1; Rock Pigeon, 50; Eurasian Collared-Dove, 48; White-winged Dove, 1; Greater Roadrunner, 1; Great Horned Owl, 1; Downy Woodpecker, 5; Hairy Woodpecker, 3; Northern (Red-shafted) Flicker, 12; Northern Shrike, 0, CW ; Steller's Jay, 28; Blue Jay, 4; Western Scrub-Jay, 28, (HC); Pinyon Jay, 34; Black-billed Magpie, 102, (HC); American Crow, 140; Common Raven, 47; Horned Lark, 18; Black-capped Chickadee, 36, (HC); Mountain Chickadee, 25; Bushtit, 1; White-breasted Nuthatch, 7; Pygmy Nuthatch, 9; Brown Creeper, 3; American Dipper, 1; Mountain Bluebird, 4; Townsend's Solitaire, 5; American Robin, 57; European Starling, 97; Cedar Waxwing, 12; Spotted Towhee, 1; American Tree Sparrow, 1; Song Sparrow, 2; White-throated Sparrow, 1; Dark-eyed Junco, 52; Dark-eyed (Gray-headed) Junco, 6; Dark-eyed (Oregon) Junco, 20; Dark-eyed (Pink-sided) Junco, 19; Dark-eyed (Slate-colored) Junco, 22; Red-winged Blackbird, 26; Gray-crowned Rosy-Finch, (CW); Black Rosy-Finch, (CW ); Brown-capped Rosy-Finch, (CW); House Finch, 72; Pine Siskin, 4; American Goldfinch, 22; Evening Grosbeak, 25; House Sparrow, 44. For some reason, I get a kick out of the fact that the White-winged Dove, Sharp-shinned Hawk, the Rosy-finches, and one of the Brown Creepers were all from my own yard. I so want my yard to be a special place for birds. Polly and Paul found the Roadrunner and had the other Song Sparrow, the White-throated Sparrow, the Towhee and the Shrike, as well as the large flocks of several Jays...right in their yard. Dave Silverman, Dave Moore and I got to see the small flock of first-time-on-the-count Cedar Waxwings at Dave Moore's home. Margie got the Dipper and, I think, the Prairie Falcon. Good eyes on that girl! Do click the photographs for a larger image. Photos from Wikipedia, except the three noted from P. Neldner. Thank you so much for sharing here! were hundreds of Rosies I like to call mine! Okay, so I know they are not mine and I know that they'll be gone as soon as the weather clears up; but it's a Very Merry Christmas to me...and one I hope you all share, too. Hey, it's official and after Noon...it's Christmas Eve! So, these birds are pretty tame; but I was out trying to get them used to someone walking around in the yard. The silly things must know danger lurks, cuz they take to the skies every few minutes. Or perhaps it is to let the hundred or so waiting get a chance to feed? Sunday, those participating in the Spanish Peaks CBC will come visit my yard; I do hope we get snow...to ensure these babies will return. Last year we watched 'someone' enjoy lunch. I wonder if this is his impression in the snow? Yeah, I found it in my own backyard. Ahhhhhhhh... the magic of PhotoShop! Okay, the other day I had two visitors... Each landed on a different part of the same pole and I got photos of both. Here you can see the two birds together...in a 'PhotoShopped' image. Yes, I did not spend the time to ensure the photos were exact; the bird on the left appears slightly smaller than it should...you can see on the right of that image (where the pole 'meets' the rest of the pole in the photo on the right), that it is really too small. That said...size really doesn't matter here; in both species the female is considerably larger than the male and there are slight differences in size between all birds in a species (just like with people and other animals). Still, this affords us a place to begin looking at the two birds. 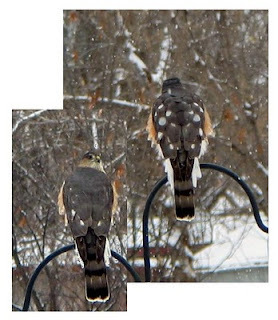 It was my belief that these are both Sharp-shinned Hawks...partly because of their size (I know that's rife with problems); they were both about 12" long. Part of my decision was with regard to their tails...both of which seem identical to me...and sort of square. No? My problem is that a very well respected friend of mine has suggested one is a Cooper's and one is a Sharp-shinned. She did NOT have benefit of this spiffy image, however...and I greatly appreciate her willingness to discuss the differences in the birds with me. I thank her again! The Cooper’s Hawk is a crow-sized hawk with short, powerful, rounded wings and a relatively long tail. Males markedly smaller than females; total length 16.5” with weight at about 1-pound. Barred rufous underparts in adults, streaked brownish underparts in immatures. In adults, dark blue-gray crown contrasts with lighter-colored nape. Tail with 4 straight alternating bands of dark and light brown or blue-gray in adults; brown tail bands in immatures. Tail white-tipped. Sexes similar in plumage, but males, on average, more brightly colored than females. Back and upper wing coverts brown to blue-gray in adults. In Juvenal plumage, back and upper wing coverts medium brown with some white mottling and rufous feather edging. Sharp-shinned Hawk is a small, slender, feisty accipiter, with short, rounded wings and a long, narrow tail. Length is 11” and weight at about 5-ounces. In adult male upperparts, including wings and tail, bluish gray to slate, becoming slightly darker on the crown. Tail crossed by 3–5 visible slaty bands and narrowly tipped white. Tail usually appears square in shape when folded, but often appears slightly rounded when spread. Adult plumages similar throughout year. Adult eyes red, juveniles pale yellow. Open wing appears dark above but whitish below with remiges boldly banded with black. Underparts primarily whitish and heavily barred with rufous or tawny on breast, belly, side, and flanks. Adult female similar in coloration, but upperparts more brownish olive and underparts less heavily barred than in males. 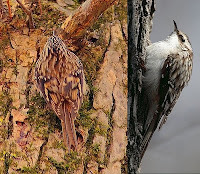 In juveniles, head heavily streaked grayish brown and white or grayish brown and tawny on crown, nape, and sides of neck, with a pale superciliary stripe. Back, rump, and wings dark brown to dark brownish gray, with back and wing-coverts margined paler. Occasional white feather bases show on back and wing-coverts. Underwing white and boldly barred with dark brown. Tail as in adults but gray often replaced by brownish. Underparts white to cream with broad dark-brown streaking on breast, belly, side, and flanks. Field identification difficult owing mostly to similarity with smaller Sharp-shinned Hawk and the larger Northern Goshawk in Juvenal plumage. Cooper’s have more rounded tails than Sharp-shins or Goshawks, but difference appears slight. White terminal tailband wider in Cooper’s than in Sharp-shins. In immatures, streaking tends to end somewhat higher on the belly in Cooper’s than in Sharp-shins. Crown color contrasts with nape in adult Cooper’s more so than in Sharp-shins. In Juvenal plumage, the bars on the rectrices are nearly aligned in Cooper’s but offset in Goshawks, creating a zigzag effect. Undertail coverts streaked in Juvenal plumaged Goshawks; white and not streaked in Cooper’s. Okay...now I seriously wonder if I'll ever get it right! LOL But tell me, with the above 'Shopped' photo; what say you now? Please leave your comments, won't you? Resource (which I quoted liberally): Cornell's The Birds of North America-Online. The photo at least...is mine. spitting snow. Still, it had started before I left work last night and was to get worse, so I stayed home, as I'd told my boss I'd probably do. undulating flocks of starlings. It's wild to see. I wondered a bit what was spooking them, usually they stay the day. 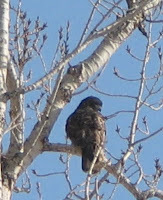 And then I noticed what I imagine is a young Sharp-shinned Hawk...because of the spots on it's back. Gawd, I do love Google! I found a couple images that will give you an idea of what I've seen. They're from a blog at TYWKIWDBI.blogspot.com...which is not all that much about birds, as it turns out. 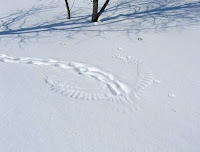 But, the author apparently got a couple fine shots of impressions raptors left in the snow, hunting rabbits. Wild, huh? That is pretty much what I saw in my yard...though much smaller; Sharpy sized. and apparently decided the hell with it, he'd just have some finch food, instead! If I had a better camera, you'd notice his tongue...lapping away at the tiny opening his bill won't fit into. That's a first in my book. Later in the day, I noticed yet another little Sharpy. You will notice this bird is likely older; not only is it's back more gray...but it's eyes are that beautiful coppery-red color. What a georgeous bird. One of these days, I'll catch a Cooper's on that shepherd's hook...I'd love to really get a good look at the 'rounded' tail and really how it compares to the Sharp-shinned's 'sharply cornered' tail. That said...this guy does look a bit 'hulking' with that dark cap, huh? Yeah, so far I'm going by size alone. Sunday is the Spanish Peaks CBC (we'll meet at 8 AM at the Town Park's pavilion on Ryus Street (west of Main Street), if you care to join us). I think this is the 21st Christmas Bird Count for our area...every time lead by our illustrious leader: Dave Silverman! He's awesome. As I said, it was quite a day; on the way up the hill (here in town), I drove past a small herd of deer all beded down in a field by the road. One beautiful, fully-racked buck lay with nearly a dozen does. A couple hundred feet further and two more males with large racks were sparring and kicking up the snow. Sometimes, I just feel so fortunate to live where I can see such things...every day. It's wild! Annie generously let me post her photo here...I'll include her commentary below. Enjoy! The roadrunner has the run of the whole hilltop pretty much! It'll perch and sleep on our bikes out front and takes shelter under our picnic table often. I saw it just yesterday so it survived the cold snap. Yay! 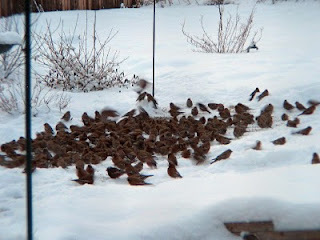 Last season I bought a wet-vac for just this purpose; cleaning excess seed from underneath the bird feeders. This will lessen the possibility of infection and sickness; sometimes evident this time of year. Heck, Kevin Cook; local naturalist, is the one who suggested I try it. ..surely I'm not the only one, huh? 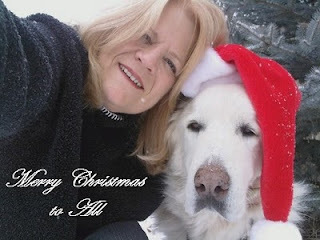 He's a good guy, interesting as the dickens; you might enjoy reading him. Of course, such cleaning may also lessen the possibility of some of the other creatures which come by in the dark of night. Ewwwwwwwwww... Of course, the larger critters come whenever they want; deterrents or no. The best thing to do when bears are up is either not to feed, or to bring in feeders at night. A bear that comes to bird-feeders will soon be a dead bear... Don't teach them bad habits, please! for such visitors is: I found someone who mentions a new product I need to research. The author of Birds and Such, discovered "Seed & Hull Digester." As far as I know, various enzymes are natural things, not poison; I have long used such things to help break-up sludge in a Koi Pond...they're great. Carefree Enzymes makes the new product, as well as bird house and bird bath cleaners. Apparently it works a lot like the sludge-buster for koi ponds and protects birds from unwanted parasites and e-coli bacteria. They say it is for birdfeeders, that "Grounds beneath feeders are highly contaminated from bird droppings, organic contaminants, parasites and e-coli bacteria from molded birdseed. A simple spray will remove these harmful contaminants. Birdseed, hulls and other organic materials are quickly decomposed, digesting them down into basic components that are easily absorbed into the environment. Treatment provides a clean environment for birds to scavenge freely." Have you tried it? There is a wonderful explanation of how these sorts of things work here, but I found only one MSDS Sheet(for a different product (the bath cleaner.)) I've discovered the manufacturer doesn't sell the stuff themselves, and it looks like it costs $10-$20 for thirty plus ounces. It is to be mixed 25 parts water to one part digester. Looks like something I'd use. And anything to keep these monsters at bay! Okay, I really thought I'd try to get away from the politics, whining about sexism and that Armageddon seems right around the corner. That said, I just had to include this piece o'work. Ya know...I don't really know why people DO such things; and ya can hardly tell the boys from the girls!!! What is the world coming to? Let me know if this ruffled your feathers as much as it did mine. Come to think of it though...I wouldn't mind one or two of them in my back yard! Okay, so call me a piggy. So, I was out watching the rosies, when they all scattered. Did you know they fly in waves and patterns like starlings? Yup, though I didn't see much of that when they fly to cover. A big bird had come to check out all the activity. I was on the phone at the time and saw the huge, dark thing in a big tree over-looking my yard. The raptors love that tree this time of year. Talking with my friend Donna, she walked me through what big guys would be here this time of year, I decided it had to be a very dark morph Red-tailed Hawk. What do you think? For some idea of size...I'll include nearly the whole tree as I see it without lenses; those are the rosies in the same tree on the left. Cheeky things, huh? The point is, I saw no red in this bird...but through the process of elimination (which big raptors might I see where I live, this time of year), I'm thinking a dark red-tailed. I have to tell you, I use about a ten year old PowerShot G3 by Canon. It's only 4.0 MP, F2.0 little thing, so even with my 'long lens' (and I use that term with a smile...it's a 2X digital zoom!). No, I don't see much. LOL Hey, it was the best I could get at the time; who knew I'd become a bird watcher? young accipiter.I get both Sharp-shinned Hawks and the occasional Cooper's Hawk; but they are so hard to tell apart...especially with my inability to get a decent photograph. Most of us decided this bulky bird is a Cooper's...but then I measured the fence. It's pickets are 3.5" wide (if I remember now), but the important thing is to know I measured from the top to the nails, where you can see the bleed in the wood. That was just about 11" even. I'll include both versions of my (bad) shot to show you how I measured the bird. Using PhotoShop, I carefully selected the whole bird, head to tail, and moved the selection down so the top of the head was even with the pickets. I now see the bird is about 12" in length...which makes it a Sharpie or a small Cooper's. Cool, huh? The Gray-crowned Rosy-Finch is another lover of extreme habit found in open ground at the top of mountains from Alaska to California and out on the Aleutian and Pribilof islands. The Gray-crowned is found farther to the west than the similar Brown-capped and the Black Rosy-Finch. It prefers open rocky hillsides, often near cliffs and, like the other Rosies, winters at lower elevations. These are possibly the highest-altitude breeding bird in North America. Perhaps because of these remote breeding sites, which allow little contact with humans, the Gray-crowned Rosy-Finch seems almost tame. On breeding grounds, foraging birds can be approached to within a foot or two. Even after banding, individuals often alight less than three feet away, picking at their new bands and preening for several minutes. The Gray-crowned Rosy-Finch is most likely to be confused with other rosy-finches, but the Black is much darker and lacks brown back and breast and the Brown-capped lacks gray on head. To identify, remember it has a brown body, extensive pink on shoulders, flanks and belly, a dark brown forehead with grey behind which wraps around the head. Juveniles similar to adult females, but duller coloration, and lacking gray crown, black forehead, and pink on under parts. Size and color vary geographically. There are six subspecies of the Gray-crowned Rosy-Finch. These subspecies comprise two basic forms: a larger coastal form that lives on the vast treeless plain in the Arctic regions where the subsoil is permanently frozen and a smaller alpine-interior form that lives in the high mountains above tree-line. Additionally, the six can be separated into three gray-cheeked and three brown-cheeked forms. • Hepburn’s Rosy-Finch which winters in southern part of breeding range, east to central Montana, west Nevada, northern Utah, and central New Mexico. Substantially smaller, with shorter bill, than other gray-cheeked forms its gray and black throat contrasts sharply with dusky brown breast. 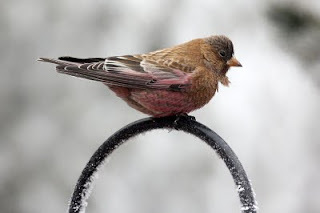 • Gray-crowned or Cassin’s Gray-crowned Rosy-Finch, which breeds in interior mountains of Alaska, British Columbia, and Montana and winters from southern British Columbia, east to southwest Manitoba and south to northeast California, Nevada, Utah, northern New Mexico. • Sierra Nevada Rosy-Finch; resident in the Sierra Nevada and White Mountains of California. Generally these birds are found in alpine areas, usually near snow fields or glaciers, talus, rock-piles, and cliffs; typically at or above timberline. It winters in open country, including mountain meadows, shrub-lands, roadsides, towns, cultivated areas, and rocky hillsides. 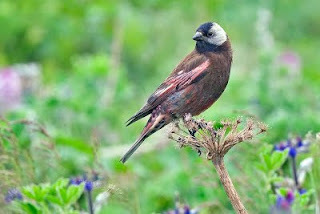 • Pribilof Rosy-Finch in summer, predominantly eats crowberry seeds but also often takes brook and sea parsley seeds. Other seeds include rush, sedge, chickweed, buttercup, cinquefoil, and bluebell. Insects taken include crane flies, ground beetles, leaf beetles, beach beetles and weevils. In winter, this bird is observed to eat almost exclusively wild parsnip. • Aleutian Rosy-Finch eats adult beetles and their larva, as well as leaves, buds and seeds of Scurvy-grass. • Hepburn’s Rosy-Finch eats almost exclusively seeds; Russian, wild grass, mustard, and sunflower. • Gray-crowned Rosy-Finch eats seeds of Whitlow grass, willow-weed, spring beauty and bear grass; in breeding season, insects include cutworms. • Sierra Nevada Rosy-Finch eats seeds of sedge, sticky cinquefoil, oval-leaved buckwheat, and cut-leaved daisy. Insects eaten include gnats, cutworms, pine needle scale (taken from white-bark pines) and mayflies. Like other Rosies, the Gray-crowned habitat includes western mountains often close to 10,000’ in nests similar to others. 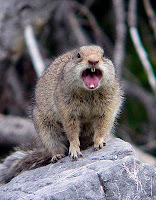 The winter range includes resident breeding areas, but also disperses to lower elevations of mountains (mainly lower slopes and valleys), coastal areas of the Pacific Northwest and casually south and east of Rocky Mountains and Sierra Nevada’s. Winter flocks also occur east of Cascades in Washington and Oregon, throughout Idaho, Montana, Wyoming, Nevada, Utah, the western half of Colorado, mountains of north-central New Mexico, and in the Black Hills and Badlands of southwest South Dakota and extreme northwest Nebraska. In California, also winters in valleys east of breeding range in Sierra Nevada crest, on lower slopes of White, Inyo and in Marble Mountains. At this time it generally it prefers open country …wherever bare ground is found and food is available. 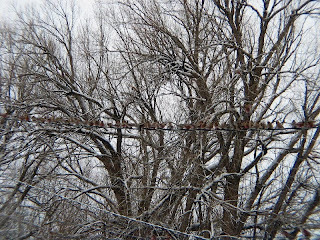 Flocks usually land on ground, sometimes on buildings, occasionally in trees or bushes, fences, telephone wires and may congregate at feeders if snow covers food or natural food is scarce. editor of the American Bird Conservancy's publication "Winging It"
Notice that the Hepburn's head is entirely gray. The conservation rating for the Gray-crowned Rosy-Finch is Least Concern. This is the fourth and final piece on Rosy-Finches. First photo is from Wikimedia; the last one by Bill Maynard who showed me that the Hepburn's entire head is gray...as you can see in his lovely photograph. ...when you think this is how people might view your enthusiasm for birds! [sigh] ...I know it's hard to watch, but hey, yesterday was the first time I'd seen a Song Sparrow in my yard; you bet I did da happy dance! Like the other Rosy-Finches, the Brown-capped Rosy-Finch is a bird of the high mountains; breeding above timberline. These birds favor alpine tundra near talus slops and cliff faces but winter at lower elevations. It is the southernmost of the three species and has the smallest distribution and is common in Colorado. Look for samples of the publication on that last link! This is the most distinctive of these related finches, with rosy colors covering more of its body than in other species, but it lacks the clear gray color on the head that is so characteristic of the other species. The Brown-capped has a cinnamon-brown on back, breast, neck and face, with a distinct black or dark-brown cap covering forehead, crown and back of the head. Like the others the pink/red is found on the belly, rump and in the wings. As with all Rosy-Finches, plumages similar throughout year, except reds are more intense in summer. Females are similar to males, but much grayer and overall-lighter in color. The Brown-capped Rosy-Finch looks most like the Gray-crowned. However, because some Brown-caps are more gray than others, and some Gray-crowns (especially females), have less gray and become browner (sometimes with no gray), the two species can look very similar. As a result, many individuals have been misidentified even in the hand and even in museum collections and by experts. Juvenile birds are drab gray-brown all over, with pinkish in wings. 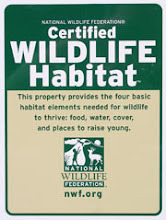 The nests are above timberline wherever cliffs, caves, rock slides, or old buildings provide nest sites, and where adequate feeding grounds on tundra, rock slides, snowfields, and glaciers are within commuting distance. Like other Rosy-finches, the Brown-caps build their nests in crevices where they stay completely in the shade. The nests are on the ground or in a crevice; consist of a tightly woven cup of fine grass, stems, and rootlets surrounded by thicker layer of woven coarse stems and roots and mud, and lined with softer grass, feathers, and hair. One Brown-capped Rosy-Finch nest was frozen in ice each night as water trickling through the site froze. Brown-caps winter in open areas, including alpine tundra during fair weather, and in the high meadows and open grassy valleys and shrub-land between mountain ranges. These rosies occasionally occur a short distance east of foothills on plains, but not as far or as often as other species of Rosy-Finch. It occurs regularly on Christmas Bird Counts (CBCs) in Colorado; infrequently in New Mexico as far south as Albuquerque (Sandia Mountains), but only once in last 50 yr on counts anywhere in Wyoming. All Rosy-finches eat insects, spiders and other bugs and seeds; this one prefers new seed to year-old seed. At feeders, individuals eat many kinds of seeds, including millet, canary seed and corn, but have been said to reject sunflower seeds…not something I’ve seen here in Huerfano County, Colorado. This bird may be declining slightly. Brown-capped Rosy-Finch currently has an evaluation level of Least Concern ...and yet it may be declining. Photos are mine... except where noted; including the lovely one contributed by Bill Maynard. Thanks Bill! 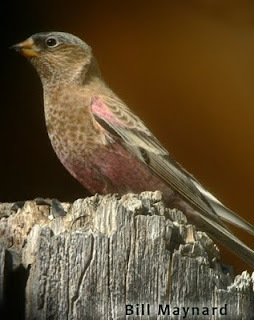 Black Rosy-Finches are uncommon birds of the high mountains in the central US, which nest above tree line; often nesting higher than all other birds on a particular mountain. These birds favor alpine tundra near rocky slops and cliff faces but winter at lower elevations. They are among the least studied of North American birds because of the inaccessibility of their alpine habitat generally, and specifically that they nest on high cliffs. Reflecting this, very, very few nests have been reached (only 3-4 as of 2002!) and only a few studies have focused on the species. 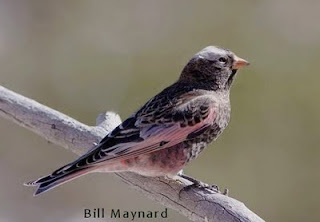 The Black Rosy-Finch is most likely to be confused with other rosy-finches but it lacks the brown look to its plumage. Its color is so dark it appears to be black on the back, breast, neck and face. Its forehead is black and a gray band wraps around the back of the head, behind the dark forehead. As with other Rosies, its bill is yellow in winter and dark during breeding season. Juveniles are similar to female, but lighter, usually grayer brown, lacking silver-gray crown, dark forehead, and pink on feather margins. During the winter, this finch is often found in mixed flocks with other Rosies throughout Colorado’s western mountains and east to eastern foot of Rockies. It is rare on plains east of mountains in northern part of state and less common in Colorado than other rosy-finches, averaging about 5% of flocks, except perhaps higher in extreme west (Grand Junction.) Black Rosies also winter irregularly across the northern tier of counties in New Mexico (except Union Co. in northeast corner) and south as far as Albuquerque; famous in the Sandia Mountains. This Rosy hybridizes with other Rosy-Finches, though like all Rosies it is little studied. The extent of hybridization is unknown and many birds may be unidentifiable. 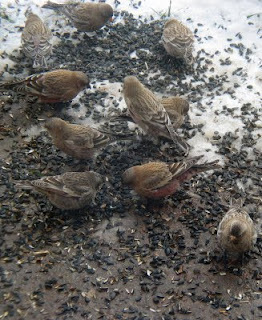 Wintering flocks of Black Rosy-Finches roost in large communal roosts in abandoned buildings, caves, mine shafts, on rafters of barns, and in clusters of old Cliff Swallow nests. Old mine-shafts may be especially valuable to this bird. Unlike other Rosies, these have never been found to nest in buildings. This Rosy breeds in alpine areas, usually near rock piles and cliffs at elevations of 10,000 – 13,000 feet, wherever outcroppings and rock slides provide nest sites with protection from falling rocks and hail. Almost always nests look out over the tundra and valleys where they feed. Conservation: While there are no apparent population trends; Black Rosy-finches might be declining. Because these, like other Rosy-Finches favor extremely remote breeding habitat, it is unlikely human population will adversely affect it. These birds seem almost tame and will tolerate people within three feet. Adults are tolerant of researcher-visits to their nests, so likely would not be disturbed by human recreation like climbing and skiing; however Common Ravens drawn by human garbage could cause negative impact through increased nest predation. Domestic grazing animals could reduce food supplies and attract Cow-birds that also predate; climate change will likely cause habitat loss and fragmentation and the loss of some populations. Increase in radioactive fallout could lead to significant accumulation in body tissues because of species’ habit of foraging on high-elevation snowfields that frequently concentrate fission-products to high levels. Like mercury levels in the deep-sea tuna, perhaps Rosies are the 'canaries in the mine-shaft' of our world. I only wish we'd take heed! While feeding these birds will surely help them, it will also make them vulnerable to cats and window-strikes. Please keep your cats inside and your feeders near windows where birds can’t get up the speed to hit hard. I have found bird-netting placed outside over picture windows to be quite effective and causes little to no restriction of view and photography. Photos are mine... Except the first one that Bill Maynard kindly allowed me to use!